Tag Archive | "Central Africa"
On December 5th, the UN Security Council unanimously authorized the deployment of French troops and the African Union Mission in Central Africa (MISCA) with the hopes of stemming the sectarian violence that is plaguing the Central African Republic. On the 9th, the 1,600 French troops will attempt to begin disarming the fighting groups and restore order. French Defense Minister is quoted saying that “first we’ll ask nicely, and if they don’t react, we’ll do it by force.” The Security Council also made it clear that the UN should be prepared to further bolster efforts in the CAR. Provisions included requests that the Secretary-General undertake contingency preparations for the transformation of MISCA into a peacekeeping operation within three months. 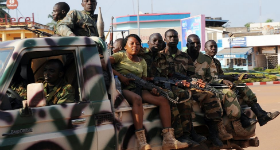 In March of 2013, the existing government was ousted by the Seleka rebels when they seized the capital and leadership. Since that time attacks on Christians and those loyal to the former Bozize regime by the predominantly Muslim Seleka forces have increased in number. In response, self-defense groups known as “anti-balaka” have formed and perpetrated retaliatory violence. Consequently, an environment of fear prevails throughout the CAR and the populace is divided along religious lines. In the day preceding the passage of the UNSC resolution, more than 100 were killed in the capital of Bangui alone. According to the Red Cross, an additional 394 were killed on the following Sunday. The coming weeks and possibly months will demonstrate whether the French forces can help bring stability to the CAR. Some of the problems confronted by peacekeepers will be dealing with the religious tensions, the potential for trafficking in conflict minerals, and trying to neutralize largely de-centralized fighting forces. The UNSC asked that all States take measures to prevent the sale or transfer of weapons, supplies, and funding to fighting groups in the CAR. Regardless of what manifests in the future for the Central African Republic, a clear international mandate has been expressed with the hopes of restoring order, stopping the ongoing violence, and preventing future conflicts. Jordan Edmondson is a 2L and a Staff Editor for the Denver Journal of International Law and Policy.